To replace the installed operating system icons folders other, it is necessary to do some preliminary preparation. It is desirable that the icons were in the files, specially designed for them format ico. If you are in the file other graphic format, it can be converted to the desired, for example, using any online service. And then you can proceed directly to the procedure replacing the old icons with new. Start Windows Explorer by pressing the hotkey WIN + E. This can be done by double-clicking the shortcut to "My computer" on the desktop or click on the "start" button and selecting the string "Explorer" under "Programs". Locate and then right-click the folder icon which you want to change. Will drop a context menu where you can select the bottom item is "Properties". This way you will open a window that gives access to change some of the folder properties. Go to the setup tab. It is possible to change the folder icon and picture, which it indicates, when enabled in the settings Explorer mode "sketch". To change icons , click the bottom button "Change icon". Click the "Browse" button, locate your computer prepared. ico file and click "Open" button (or press Enter). If you are using Windows Vista, then in addition to ico files you can use images in png format. In addition, any operating system has the ability to look for icons in executable files (. exe) or library resources (with extension. dll). These file formats can contain entire sets of icons, access the list which you get if you select the desired file using the "Browse"button. 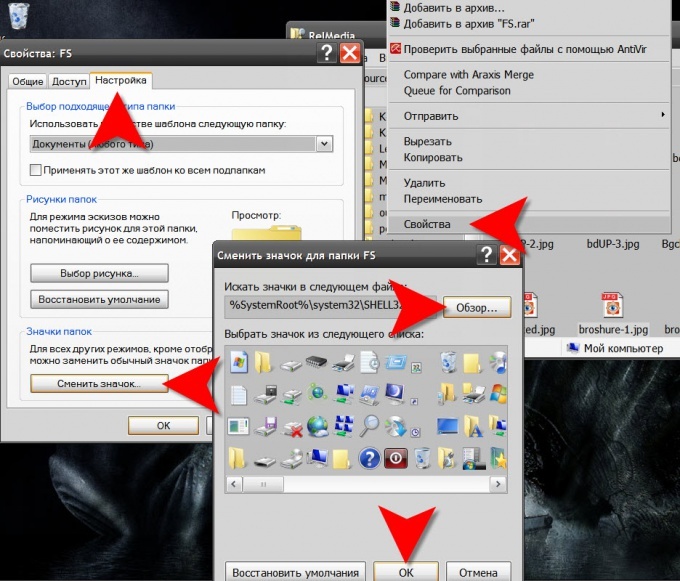 Click "OK" in both open Windows ("Change icon folder" and "folder") and replace the folder icon to be completed. If you need to change the icon of other folders, repeat the operation. Another way to replace the images folder in the system involves the use of programs designed to change the graphical interface of the operating system. You can find a lot of tweakers, for example, Microangelo On Display, Stardock IconPackager, TuneUp Utilities, etc. They change labels and icons for all folders at once.